In an effort to diversify conversations at the Neighborhood Board meetings, the Neighborhood Commission Office (NCO) dedicated April 2014 as “Community for Keiki Month.” For the boards’ first-ever monthly theme, the NCO gave a call to action for all 33 neighborhood boards to incorporate keiki through the invitation of keiki groups, schools, and relevant organizations. The board chairs and members were also asked to highlight ideas, issues, and concerns that most affect our keiki. 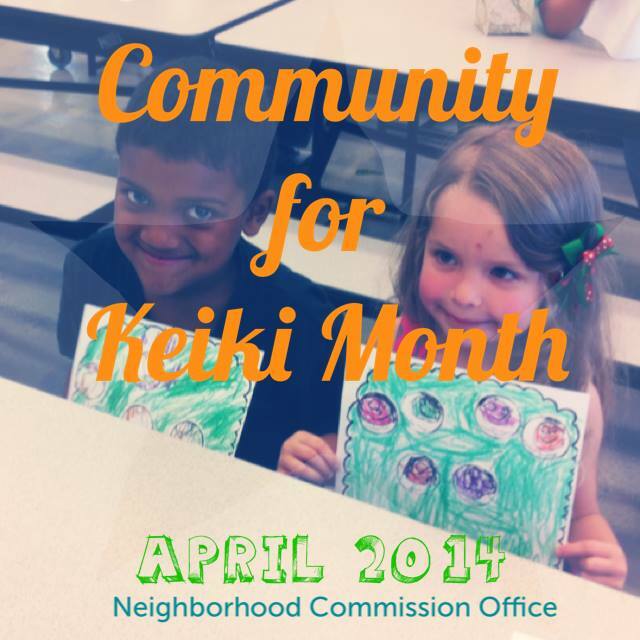 Following the announcement of April as “Community for Keiki Month” at the March 2014 Conference of Chairs, 17 chairpersons rose to the occasion and incorporated keiki into their April agenda. The enthusiasm from the boards overflowed to other participating city agencies, including HPD, HFD, BWS, and the Caldwell Administration. 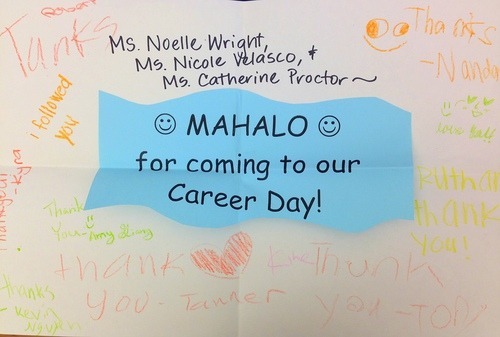 Beginning in April and to be continued in the fall, the NCO has begun visiting Oahu schools to introduce students to the Neighborhood Board system, and talk about the importance of community service as an important component of leadership. At the NCO, we truly believe that our job is to serve students by providing opportunities for growth, learning, and leadership through the neighborhood boards. More photos of our visits! On April 14th, in support of the Hawaii Foodbank, the NCO partnered with the Mayor’s Office of Culture and Arts to show Disney hit movie “Frozen” to over 250 keiki at the Mission Memorial Auditorium. Admission for all keiki was a can of food to donate. 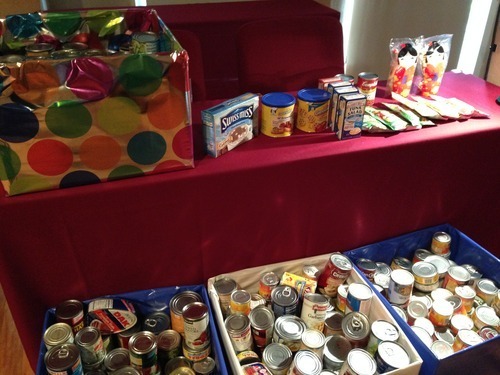 By the efforts of our youngest schoolchildren, we raised 400+ lbs of food! A short video of the students on our Instagram here. On behalf of Mayor Kirk Caldwell, the NCO marched at the March of Dimes’ March for Babies on April 26, 2014. Photos on our Facebook here. 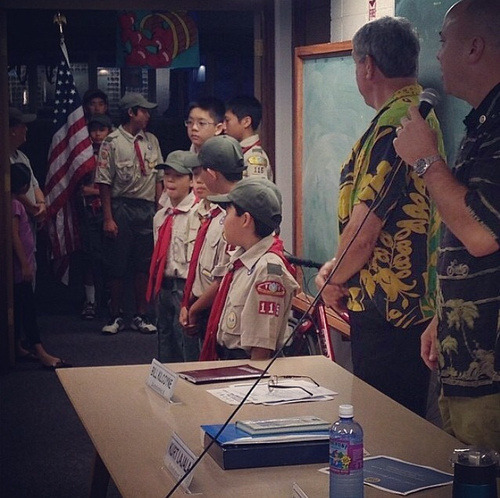 Various Neighborhood Boards around Oahu have participated by inviting a Girl or Boy Scout troop to lead the Pledge of Allegiance at the meeting, while others invited local organizations or schools to give presentations. Mililani/Waipio/Melemanu No. 25 even dedicated a portion of the meeting to recognize members in their community whose work goes to serve the keiki in their neighborhood. 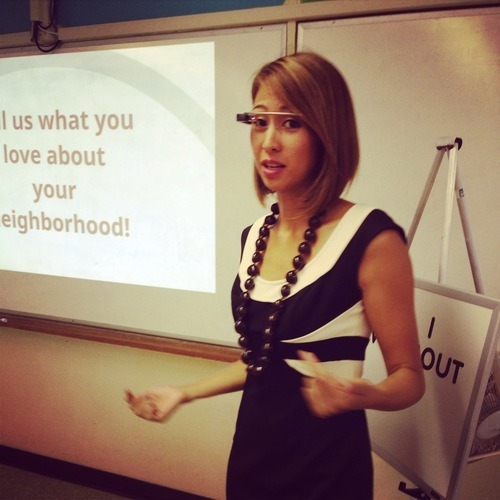 Of the 31 Neighborhood Boards that met that month, 17 – 50% – of Boards participated! A HUGE MAHALO to the following Boards for participating in this month’s theme! Hawaii Kai No. 1, Kuliouou-Kalani Iki No. 2, Kaimuki No. 4, Palolo No. 6, Manoa No. 7, McCully/Moiliili No. 8, Nuuanu/Punchbowl No. 12, Liliha/Puunui/Alewa/Kamehameha Heights No.14, Waipahu No. 22, Ewa No. 23, Waianae Coast No. 24, Mililani/Waipio/Melemanu No. 25, Koolauloa No. 28, Kahaluu No. 29, Waimanalo No. 32, Makakilo/Kapolei/Honokai Hale No. 34, Mililani Mauka/Launani Valley No. 35. Wahiawa No. 26 and North Shore No. 27 recessed in April, but will participate in May! Kaimuki Board No. 4 loved the idea so much that they will now incorporate a keiki-related item to its meeting agenda every month! We love this idea, and encourage all boards to do the same! 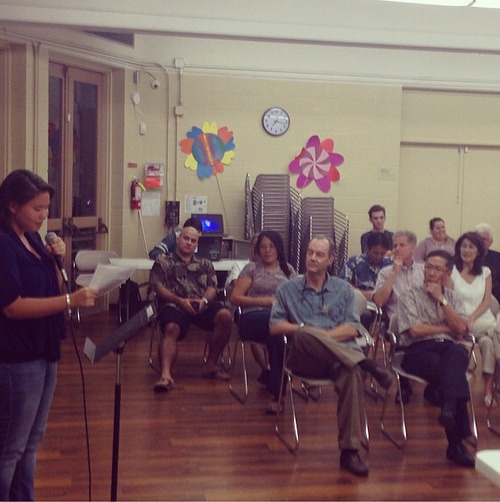 Kylie Umebayashi, Student Council President at her local high school, giving a presentation on student leadership at the Kaimuki No. 4 meeting. 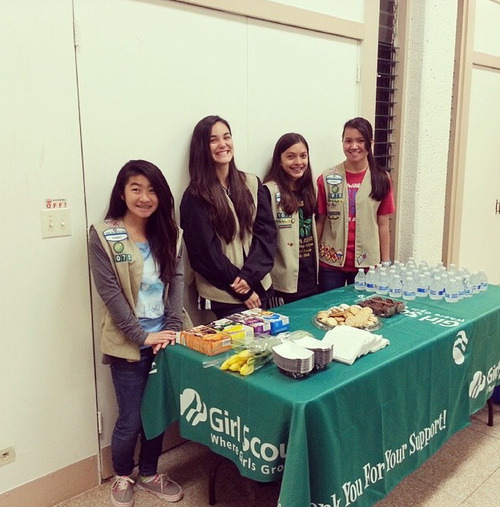 Girl Scouts served their famous cookies at the Mililani/Waipio/Melemanu No. 25 meeting! Kuliouou-Kalani Iki No. 2 opening up their meeting with the Pledge of Allegiance led by their local Boy Scout troop. 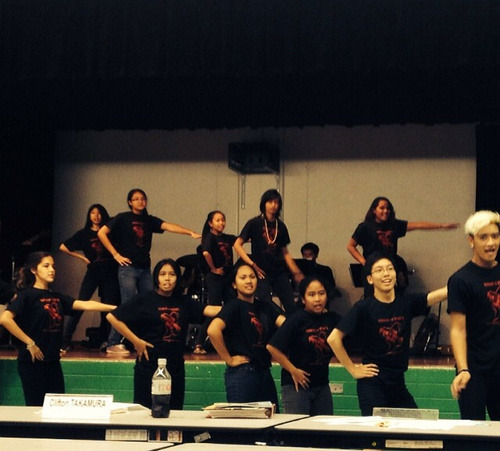 Kaimuki High’s Time Warp giving a preview of ‘The Rocky Horror Show’ for McCully/Moiliili No. 8. The City & County of Honolulu supports Community for Keiki month! Mayor Kirk Caldwell extended his warm mahalo to the Boards for recognizing Community for Keiki Month. 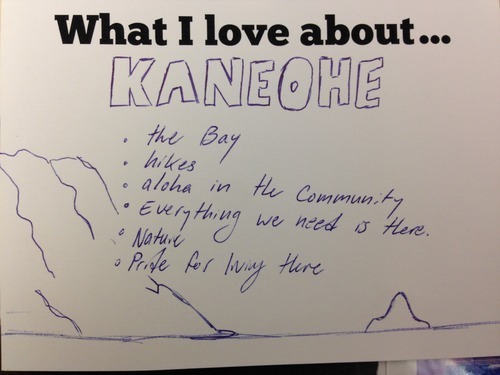 In his message to community, he highlighted the fact that participation as a Neighborhood Board member offered a unique opportunity to actively assist government in creating and maintaining an island community that meets the needs of all residents, including our keiki, and thanked the board members for their dedication. Board of Water Supply talked about their multitude of public education programs around Oahu, featuring tons of fun activities for keiki! More info here. Department of Parks & Recreation reminded the community about its Summer Fun events for keiki! Running from June 25-July 12, 2014, find more info here. In 2011, approximately 136,000 children nationwide were treated in emergency rooms for burns. To keep children safe create a kid free zone in the kitchens around stoves and hot items. Place pots and pans on the back burner and away from children’s reach. Keep cigarettes, lighters and other smoking materials out of children’s reach or in a locked cabinet. Whether children are walking to school, the park, or a friend’s house make sure they arrive safely. Teach kids to be safe and walk on sidewalks or paths and cross at street corners. Teach kids to put down their devices and to look left, right, and left again when crossing the street. Remind kids to make eye contact with drivers before crossing the street and to watch out for cars that are turning or backing up. When driving, be especially alert in residential neighborhoods and school zones and be on the lookout for bikers, walkers or runners who may be distracted or may step into the street unexpectedly. Parents, guardians, and teachers should teach children not to talk to strangers, not to accept anything from strangers, and not to accept rides from strangers. The children should let their guardian know if an unknown adult approaches them and report it to HPD. Remind children to obey traffic laws, use crosswalk signals, and to avoid riding skateboards in the streets. This entry was posted in Community, Hawaii, In My Hood, Kids. Bookmark the permalink.